Here’s the deal: Roland buried the lede on this one. They want dealers and press to focus on what they’re calling the AIRA SP-404A performance sampler. 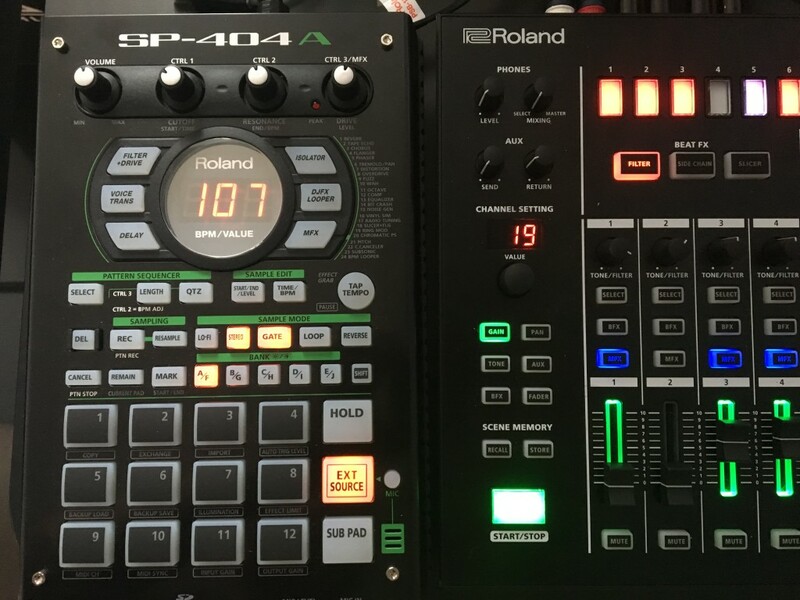 But the thing is, despite the “A” (for AIRA), the 404A actually is an SP-404SX, in a new paint job and with some new Loopmasters sample content bundled. Don’t get me wrong – the 404SX is already really great. It’s a wildly popular sampler (Roland claims the most popular mobile sampler), it runs on AA batteries, and it’s easy and fun to use. I see them everywhere. But unless you absolutely need yours to be black and are incapable of finding samples, you should probably see if you can get a deal on the 404SX. No, the news here is actually a firmware update for the TR-8 – that’s the big, black-with-neon-green original AIRA drum machine. 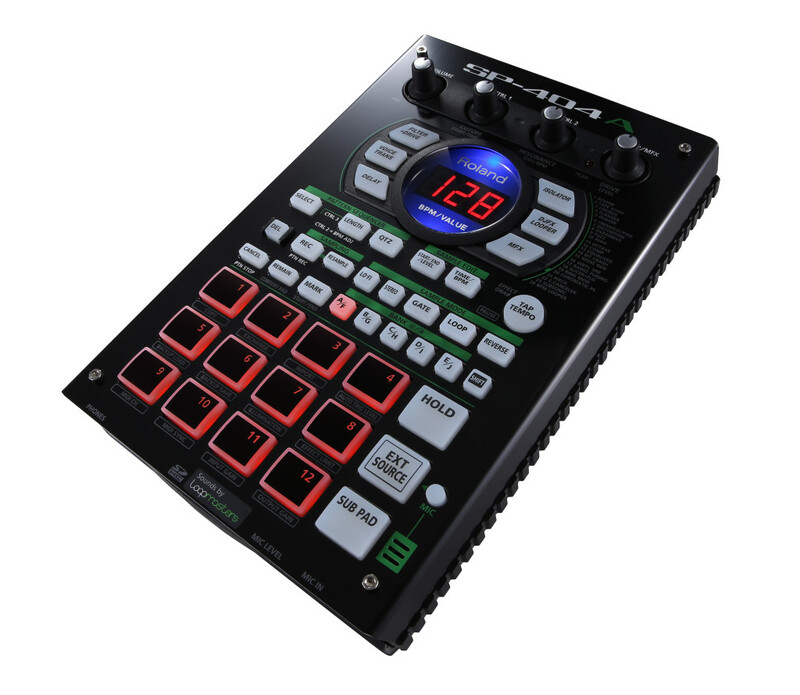 The TR-8 gets a firmware update today that lets it trigger external gear via MIDI. Updated: the firmware update also adds resolution to the USB driver. The TR-8 is brilliant – it’ll sound like an 808 or 909, and it’s got lots of hands-on controls, including faders for each part. Those faders are ideal in performance, and that’s made the TR-8 one of the most commonly spotted bits of kit in live techno and house shows. But the TR-8 can’t play samples; you’re limited to its internal, modeled sounds. So, what you get instead is, the TR-8 will now trigger external gear. Actually, it’s the SP-404SX/A that’s hard to support, because its 12 pads have fixed MIDI notes. Pads run from B2 (MIDI note 47) to (MIDI note 58). The INST SEL buttons trigger the first eleven of the SP404’s twelve pads. (Since there are only eleven buttons, you can’t trigger pad 12.) Of course, you could also just clock the SP404 to your TR-8, but this way, you can do all your sequencing on one instrument, and mix and match 404 sample sounds with the internal TR-8 sounds in one place. You can set each pad to internal sounds, external sounds, or both simultaneously, to mix however you’d like. And this isn’t limited to the SP404SX/A; it’s just convenient for that hardware. It wouldn’t be hard if you have a different sampler to adjust that sampler to the TR-8’s new fixed MIDI note outputs. The other addition: USB audio now supports 44.1, 48, and 96 kHz sample rates via USB audio. I’d love for the TR-8 to have its own internal sample playback capability. But given something like an SP-404 is already set up to make it easy and hands-on to capture your own samples, having another piece of gear has some advantages in the meanwhile anyway. Also, even with those cool Boutique models on offer, the TR-8 remains an outstanding buy. And it’s clear Roland isn’t abandoning its first-generation AIRA buyers, even as it unveils new kit. I love the Boutique TR-09 and TR-08, but before you buy one, you should still comparison shop the TR-8 and see which best fits your needs and preferences. But for the record: the TR-8 has 808 and 909 and 606 and (via expansion) even 707 and 727 sounds. And it has faders. And it now has external MIDI triggering. And more tracks. And more internal effects. Basically, if you’re getting the Boutique options, you’re doing it for their refreshed sound models, format factor, trigger outs, and looks. Thanks for the feedback, readers!